Astronauts train for the Apollo 17 mission while the support team briefs them. In this historical photo from the U.S. space agency, Apollo 17 Commander Eugene A. Cernan and Lunar Module Pilot Harrison H. Jack Schmitt are preparing the Lunar Roving Vehicle (LRV) and the Communications Relay Unit (LCRU) mission simulation on Aug. 9, 1972. Support Team Astronaut Gordon Fullerton, standing, left, discusses test procedures to be performed in the High Bay of the Manned Spacecraft Operations Building (MSOB). 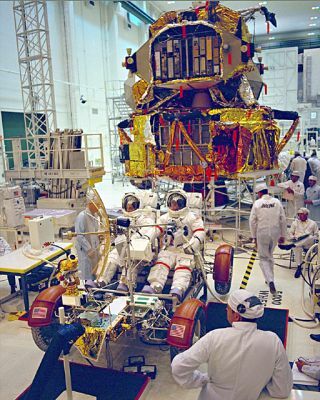 The Lunar Module Ascent and Descent stages also receive preflight checkout in preparation for the sixth U.S. manned lunar landing mission.